Germany—No Country for Old Workers? The employment situation of older workers in Germany used to be poor. However, in recent years it has improved considerably. Germany has shifted its policies to strengthen the labor market performance of older workers. Policy has focused on less early exits of older workers and far-reaching institutional changes concerning public pension schemes and unemployment benefit systems. A better overall development of the labor market and an increased labor force participation of women contributed to the more favorable employment situation of older workers. Nevertheless, we still observe severe problems for certain groups of older workers. The older workers are and the lower their skill level is the weaker is their labor market integration. If older persons are already unemployed they will experience severe difficulties to (re-)enter the labor market. In order to become actually a country for old workers the issue of employability needs much more attention. Such a strategy relies on continuous skill improvement as well as a healthy environment and does not only address older workers but also younger workers facing a prolonged working life. An erratum to this article can be found at http://dx.doi.org/10.1007/s12651-011-0097-z. An erratum to this article can be found at http://dx.doi.org/10.1007/s12651-011-0095-1. Die Beschäftigungssituation älterer Arbeitnehmer ist in Deutschland nach wie vor nicht zufriedenstellend. Sie hat sich jedoch in den letzten Jahren deutlich verbessert. Seit geraumer Zeit unternimmt die Politik erhebliche Anstrengungen, um die Arbeitsmarktposition Älterer zu stärken. Die Maßnahmen zielten darauf, vorzeitige Übertritte in den Ruhestand zu verringern und speziell für Ältere Arbeitsanreize durch Arbeitsmarkt- und Rentenreformen zu erhöhen. Begünstigt wurde die Beschäftigungssituation der Älteren durch die sich insgesamt verbessernde Arbeitsmarktlage sowie die allgemein wachsende Erwerbsbeteiligung von Frauen. Nichtsdestoweniger sind weiterhin Arbeitsmarktprobleme für Ältere unübersehbar. Je älter sie sind und je geringer ihre Qualifikation ausfällt, desto niedriger ist deren Arbeitsmarktpartizipation. Sind ältere Arbeitnehmer erst einmal arbeitslos, haben sie nur eine geringe Chance auf einen Wiedereinstieg in den Arbeitsmarkt. Um zu einer weiteren und nachhaltigen Verbesserung der Beschäftigungssituation älterer Arbeitnehmer zu kommen, ist der längerfristigen Beschäftigungsfähigkeit mehr Aufmerksamkeit zu schenken. Die dafür erforderlichen Ansätze umfassen Maßnahmen des lebenslangen Lernens und des gesunden Alterns und betreffen nicht nur die Älteren selbst, sondern gerade auch Jüngere mit einer verlängerten Lebensarbeitszeit. For most industrialized countries the labor market performance of older workers is of particular relevance for the future because the demographic change is hitting the economies more or less severely. This is also true for Germany, where the population is definitely shrinking and so is the labor force. Without any changes in labor market participation rates over time and without any net migration the potential labor force would decrease by more than 15 per cent until 2025.1 At the same time the labor force is growing older. The share of workers aged 50 years and older in the labor force will have increased from 23 per cent in 1990 to roughly 36 per cent in 2025. In addition the baby boomer generation in middle age groups—who will be the older workers of the future—are not only a strong cohort, but their average skill level is also higher than for older cohorts. Thus, the availability of older workers will become more and more important for the labor market and this not only with respect to the level but also regarding the composition of labor supply. Thus the decision of the German government to raise the retirement age stepwise up to 67 years until the year 2030 follows the necessity to save the German social security system which is mainly financed by contributions connected to employment. But it also reflects that the German economy and German firms will be more dependent on older workers in the future. The employment situation of older workers used to be poor in Germany for a long time. This is true compared to younger workers in Germany as well as compared to older workers in other countries. However, recently we observe an improved labor market performance of older workers in Germany which we will look more closely at in the following sections. We will start by giving a more general and theoretic overview focusing on different impacts on the employment situation of older workers in Sect. 2. In Sect. 3 we will describe the employment situation of older workers in Germany in depth. How did the labor market situation of different groups of older workers develop during the last decade? Do we observe significant changes in turnover within the labor market for older workers and does this imply entries or exits? In Sect. 4 we will discuss recent policies concerning older workers which may have—to a greater or lesser extent—influenced the employment situation of older workers. Section 5 focuses on long-term issues such as employability and the role of active labor market policies. Finally, Sect. 6 summarizes our findings and sketches future challenges concerning the labor market prospects of older workers. The situation of older workers on the labor market is influenced by various factors. Most fundamentally and in contrast to other age groups employment decisions of firms and of older workers are not determined solely by labor market circumstances but also by the design of the pension system. More specifically the determinants for employment of older workers can be discussed in three steps. First of all, the overall level of participation in the labor market and other macro issues may positively or negatively affect older workers. Secondly work (dis-)incentives caused by legal rules such as options for early retirement and conditions for receiving unemployed benefits need also to be carefully taken into account. These factors may pull older workers out of employment. Finally, there are specific incentives and particular barriers on both sides of the labor market which are of certain relevance for the labor market participation of older workers. They consist of the availability of attractive job opportunities for older workers on the one hand and the employability of this particular group of labor on the other hand. The more there are barriers to employment, the more are older workers pushed out of the labor market and into retirement. Let us start with looking at the impact of the general economic situation on the employment situation of older workers. The level of participation reflects to a considerable extent the macroeconomic performance of a country or a region. In addition, family-friendly employment policies particularly encouraging younger women to stay in the labor market have a long-run impact even for older cohorts. In general, all age groups benefit from a higher level of employment (Eichhorst 2006). Figure 1 depicts the positive interrelation between the employment rates of people aged between 25 and 54 and people aged between 55 and 64 from an international perspective. This to some extent also contradicts the thesis of a trade-off between the labor market success of younger age groups on the one hand and older age groups on the other hand. The general proposition is also true from a regional perspective (Hirschenauer 2007). The share of employed covered by social insurance as a percentage of the population in the same age group goes along with the level of employment in a certain region. In a region with a more favorable labor market situation, selection does not negatively affect less competitive workers as strong as it does in regions with a poor employment situation. Work (dis-)incentives caused by formal institutions play an enormous role with respect to the labor market situation of older workers. Among others they are particularly determined by public pension schemes and unemployment benefit systems. Public pension schemes influence work incentives in many ways. The age at which retirement benefit becomes available can exert a powerful influence on labor market participation. Of particular importance in this context are the official retirement age, the early pension-eligibility age as well as official and de-facto early retirement schemes (OECD 2006). Work incentives are also influenced by benefit entitlements. By increasing future income for older workers, early retirement will be encouraged. Retirement decisions are also affected by the degree of flexibility in combining income from work and pensions. Working after the de-facto retirement age may be discouraged by institutional arrangements and can constitute an “implicit tax on continuing to work” (Duval 2003). In addition, other formal institutions are not neutral with respect to older workers. Especially generous unemployment benefits reduce the intensity of job search (Bassanini and Duval 2006). This is particularly true if older workers can receive benefits for a longer duration than younger workers or are exempted from general eligibility requirements or having to look for work. Incentives and barriers to employment exist on both sides of the market. Employers can have negative perceptions about the productivity and the adaptability of older workers. Such attitudes may be based on more or less objective factors (e.g. lack of computer skills) or on stereotypes about the weakness of older workers. The latter can be seen as age discrimination in the workplace. Employers may also prefer to substitute older workers by younger workers due to the rising age profile of wages relative to productivity. On the one hand, the OECD earnings database shows that wage profiles tend to be steeper as a function of age for more educated workers (OECD 2006). Although there is no clear-cut empirical evidence between age and productivity in general (Boeri and van Ours 2008), individual productivity might decline in some dimensions (such as physical or mental abilities) with age (Skirbekk 2004; Behaghel and Greenan 2005). With respect to older workers firms often associate little or no benefits to investing in on-the-job training. In addition, there can be difficulties in adjusting employment as a result of dismissal protection regulations covering particularly older workers. It can lead to greater retention of workers since it raises firing costs. But it also raises the effective costs of hiring workers and so may reduce the number of hires. Older workers often face difficulties to stay in the labor market or to return into employment. Due to technological and structural change older workers can lack the skills required by employers. In addition, they may suffer from poor health or face rather demanding working conditions. Such issues obviously have a strong impact on decisions concerning labor market participation. E.g., blue-collar workers are more likely to leave the labor market earlier than white-collar workers and highly skilled workers. The incidence of unemployment in the case of more experienced workers can cause a depreciation of older workers’ human capital and obsolescence in their skills and experience. The employability of older workers can also be harmed by restrictions in the access to employment services and career advice services resulting in less help via active labor market programs than younger workers. Moreover there are often constraints for older workers on changing working hours to an appropriate level. Long working hours may particularly be onerous for older workers and may push them out of employment. In general, the labor market performance of a certain group can be described most suitably by considering the development of employment and unemployment figures. But especially with respect to older workers unemployment rates do exhibit some problems. There are several channels to reduce employment of older age groups without increasing unemployment, e.g. by transferring them to other social security systems through (early) retirement schemes or rules according to disability (Gruber and Wise 2005).2 So, decreasing unemployment ratios do not necessarily mean that the labor market participation really improves. A substantial part of the work force may already have retired or left the labor market through other channels. Employment covered by the social security system is a suitable measure for the capacity of the labor market.4 Figure 2 clarifies that the relative growth of employment covered by the social security system for people over 50 has been superior to the development for people aged below 50 years. With respect to subgroups of older workers we observe some variations. While the employment situation of workers aged 60 plus and between 50 and 54 improved above average, the number of employed aged between 55 and 59 years went down until 2003 before it also started to rise from then on. In absolute terms we observe that the employment of older persons (50plus) rose by roughly 2.1 million to roughly 7.3 million while the number of employed in the group under 50 years decreased by 1.7 million to 20.3 million. Looking at absolute levels of employment also reveals that the more than doubling of employment for the group 60 plus was based on a very low initial level of about 500 thousands employees in 1998 (Fig. 3). In absolute terms the labor market integration of persons between 50 and 59 years looks much better. The strongest increase can be found within the group aged between 50 and 54, where employment rose by roughly 1.1 million to almost than 3.5 million. About two third of the absolute gains in employment in the age group 55 plus can be attributed to female employment—within the group aged 55 to 59 the fraction is even 74 per cent. With respect to the demographic changes in Germany one might argue that an increase of older workers does not come as a surprise due to their growing share in the population. This argument is especially relevant for the subgroups of older workers between 50 and 54 years which have been growing since 1998. The group aged between 55 and 59 years experienced a drop until 2003 and has become stronger since then. This corresponds with the decreasing number of employees in this age group from 1998 to 2003 in Fig. 3. The oldest group aged between 60 and 64 years was declining during the whole period and started to increase in 2008. To adjust the absolute numbers according to these demographic effects we calculate employment ratios. By relating employment covered by the social security system to the population of the same age group we can assess whether the labor market participation of older workers really increased. All in all, the positive trend remains visible (Fig. 4). Even in the course of the economic crisis in 2009 the employment figures of older workers improved. It is known that persons below 25 years in general are more affected by the business cycle than older workers. For youngsters both, the reduction of unemployment in boom periods and the increase in periods of recession is higher. 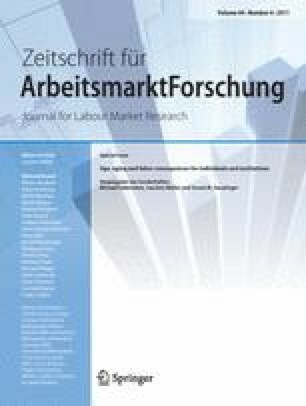 With respect to the impacts of the crisis this can be explained by the strategy of German firms to secure jobs of the core workforce while temporary workers—especially agency workers—were suffering from job losses (Dietz et al. 2010). This mixture of external and internal flexibility was beneficial for older workers as their share in agency work and fixed-term contracts are rather low. Like in many other countries the labor force participation of older workers is pushed by an increasing labor market affinity of women as we can see by considering the labor force participation rates of women in Western Germany for different age cohorts (Fig. 5). The stronger labor market affinity leads to rising employment ratios of women. During the last decade especially the group between 55 and 59 years has caught up. So, the lion’s share of the positive development of the employment situation of older workers has to be attributed to the increasing labor market participation of women (Fig. 6). In 2010 about 45 per cent of the employees between 55 and 64 years were women compared to 36.7 per cent in 1998. The stronger labor market participation of women came along with a rising importance of part-time employment in the age group from 55 to 64 years. Its share increased from 16.9 per cent in the year 2000 to 25.6 per cent in 2010. It is important to notice that part-time work is still a female domain. For women the share of part-time work is considerably higher (44.7 per cent in the group aged between 55 and 64 years) than for men (9.8 per cent). Despite the positive overall picture the employment ratios of older people still are lying below the figures of younger age groups so we should not deny that there are some serious problems remaining. The older the workers are, the more difficulties they face on the labor market. This becomes obvious for the group aged between 60 and 64. Even though we observe some positive trends for this subgroup, too, their labor market participation of around 24 per cent is still on a very low level and far away from the ratios of other subgroups. The overall positive picture has also to be modified if we take the intense use of partial retirement in Germany into account. Since the year 2006 on average more than 500,000 people above 55 years were using the program per year which amounted to about 15 per cent of this age group in 2008 (Wanger 2009).5 About 90 per cent of the participants choose the so-called block-model. This means that a period of full-time work is followed by a period of not working—on average resulting in a fictive part-time work. As older people in the block-model are counted as being employed whether actually working or not the statistics overestimate the number of employees actually working. Unfortunately the employment statistics do not offer any valid information on the stage of partial retirement in which individuals really stand. Therefore, it is not possible to calculate the ratio of actively employed workers of these age groups properly. Thus, the employment ratios presented above have to be interpreted as an upper boundary. A lower boundary can be estimated by assuming that all people on partial retirement are not working anymore. In this case the employment ratio for the group between 55 and 64 also increases but to a lesser extent and on a lower level. The lower boundary of the employment ratio of the age group 55 plus goes up from 24.2 per cent in 1998 to 30.0 per cent in 2009 while there is a stronger increase according the upper boundary from 25.4 to 37.0 per cent. Another differentiation has to be made according to the skill level of older workers. Table 1 shows a positive relationship between the level of qualification and the overall employment rate.7 This is true for all age groups. So, being old does not inevitably come along with a low probability of being employed. For example, the employment rate of people between 50 and 59 having a university degree is quite similar to those between 30 and 49 years. But we also recognize that the employment rates decrease by age groups and the employment rate for the oldest group aged 60 to 64 remains on the lowest level. This can be partly attributed to more frequent transitions to retirement or other parts of the social security system. Finally, the combination of higher age and low skills deteriorates the chance of being employed markedly. To sum up, the skill level of workers seems to be crucial for their labor market success in the first place followed by the age of the workers and their opportunities to leave the labor market. For a broader perspective of the employment situation of older workers it is not enough to look at stocks. Additionally one should take into account labor market flows, especially entries and exits from employment and transitions from unemployment to jobs.8 The employment statistics of the Federal Employment Agency state that the labor market for older workers is less dynamic than for other age groups. The labor turnover rate relating the sum of entries in and exits out of employment to the stock of employment is much lower for workers aged 50 plus compared to workers aged 20 to 49 (Fig. 7). During the period 2002 and 2010 the labor turnover rate per year differs considerably between 22 and 28 percentage points. It is an important question how far the improved labor market situation of older workers in recent years is due to a higher number of entries or to a lower number of exits. For the period 2002 and 2010 Figs. 8 and 9 illustrate the development of entry rates as well as of exit rates. First of all, the data reveal that entry and exit rates for older workers are generally lower than for younger workers. There is only one exception: The exit rate of workers aged 60 to 64 is rather high. This has mainly to do with the fact that transitions to (early) retirement play an enormous role for the oldest age group. Looking at the development of entry rates of different age groups, the data show that entry rates of all age groups are quite stable over time. This supports the finding that recruitments are unevenly distributed between different age groups (see also Brussig 2009). The probability of entering the labor market and being 50 years or older increased during the last years but remains rather low at about 13 per cent. The inequality of entries with respect to age groups indicated by Fig. 8 can be clarified more accurately by calculating relative entry rates. Here the entry rates of older workers are related to the entry rate of workers aged between 20 and 49. The relative entry rate of workers aged 50 plus has been relatively stable at about 45%. Again we observe differences within the group of older workers. While the relative entry rate for the age group 50 to 54 years lies slightly under 50%, the relative entry rates of older groups lag more or less behind on a value of almost 40% (55 to 59 years), respectively, almost 30% (60plus). As the relative entry rates did not change significantly from 2002 to 2010 we can suppose that the improving employment situation of older workers is not so much resulting from higher entries but to a large extent from a higher stability of existing employment relations. This becomes evident when looking at exit rates. Here we observe a downward trend for all subgroups of older workers (Fig. 9). This implies that older workers managed to stay in their jobs longer and postponed their retirement to a later point of time. Nevertheless, turnover rates have already revealed that starting a new job for older workers is seldom. This can also be seen by looking at the transitions from unemployment to employment. In 2010 about 21 per cent of all transitions of older workers out of unemployment led into unsubsidized employment while this figure amounts to about 30 per cent for the group between 25 and 49 years. This picture also arises when calculating the transition rate from unemployment to unsubsidized employment. In the year 2010, 3.9 per cent of the stock of older unemployed moved into unsubsidized employment while the ratio is about 7.2 per cent for unemployed between 25 and 49 years. The older unemployed people get, the poorer is their chance to find a job. For the age group from 55 to 59 the transition rate is 3.3%, for the 60 plus only 2.1%. The difficulties of bringing older unemployed back to work result in higher long-term unemployment. Compared to all unemployed the ratio of long-term unemployment among workers aged 50 plus is about 41 per cent in 2010 which is much higher than the share of 18 per cent referring to all unemployed. These figures approve once again that bringing older unemployed back to work is still a difficult job and therefore persistent unemployment within this group remains a major problem. As we showed in Sect. 3 the labor market participation of older workers somehow improved during the last decade. Referring to the more general considerations in Sect. 2 we will now describe the overall economic situation during the last years and discuss recent policies concerning older workers which may have to a greater or lesser extent influenced their employment situation. Germany experienced a strong and employment friendly economic growth during the years before the worldwide financial and economic crisis. Older workers benefited above average from this economic boom (Dietz 2008; Bundesagentur für Arbeit 2007) which indicates that the improved overall situation kept older workers within the labor market. But we also observed that the positive trend started long before the beginning of the boom period in 2005/2006. Other possible reasons for a better labor market integration of older workers are changes in institutional settings. Indeed we observed a couple of institutional reforms on the labor market and concerning the pension system which possibly influenced work incentives (Table 2). We argue that these changes do not solely but especially affect the older work force and operate in two ways. Social Code II: Fusion of social welfare and unemployment assistance: Labor market policy focuses more on activation and demands more efforts and contributions from the unemployed. The potential threat of becoming a recipient of unemployment benefits II (UB II) puts more pressure on accepting job offers and wage losses at an earlier stage. Risk of long-term unemployment decreases. Firstly, the reforms concerning the transition from work (or unemployment) to retirement clarify that the course is set for a longer working life without offering several ways of by-passing. Already at the end of the 1990s the retirement age for unemployed, women, for long-term insured and for disabled was increased. In the second half of the previous decade decisions went a lot further. The retirement age was raised from 65 to 67 years. The new regulation will be implemented stepwise from 2012 to 2029. In addition, public subsidies for partial retirement schemes ended in 2009. Moreover, since the beginning of 2008 the regulation that unemployed being 58 years or older (so-called 58er-Regelung) do not have to be at the disposal of unemployment agencies and are not counted as unemployed is not valid any more. The so-called 58er-Regelung according to §428 of the Social Code III was one reason for the fact that low employment figures of persons aged over 60 years did not come along with high unemployment in this age group. Their unemployment rates remained at a rather low level of about 5 per cent for quite some time (Arlt et al. 2009). Since 2008 the group of older unemployed (58plus) became more visible and the yearly average of unemployed aged 58 years and older more than doubled to 280.000 in 2010 while the number of unemployed between 55 and 58 years decreased further during the same period. On the one hand, the abolition of this regulation has contributed to a more reliable unemployment statistics. However, these rising numbers do not imply that the (un-) employment situation of older workers actually worsened to a considerable extent. But it points again to the fact that there are still barriers for bringing older persons back to work. Secondly, institutional changes put even more pressure on the unemployed in general, and they additionally abolish special treatments in favor of older people. The present German system of unemployment benefits consists of status-oriented unemployment benefits I (UB I) financed by the unemployment insurance and a means-tested tax-based unemployment benefit II (UB II) financed by federal taxes. The new design of the unemployment benefits was one of the main results of the so-called “Hartz-reforms” which took place in the period between 2002 and 2005. The level of social protection became less generous especially for long-term unemployed. In 2004, the duration of unemployment benefits for older workers was reduced from a maximum of 32 months to a maximum of 18 months. Before this reform the entry rate in unemployment grew considerably while it decreased after the reform has been implemented (Dlugosz et al. 2009). In 2005, social welfare (Sozialhilfe) and status-oriented unemployment assistance (Arbeitslosenhilfe) were merged to the new UB II—a strict universal means-tested benefit. These institutional changes are particularly relevant for older unemployed with a comparatively high entitlement to UB I. Since then they do have a stronger incentive to avoid becoming a recipient of lower UB II. So the interplay of cutting the duration of UB I for older people and introducing UB II as well as more activation might have pushed the labor market participation of older people. An indication in this respect might be the increased share of older workers in temporary employment such as fixed-term contracts and agency work (BMAS 2010). More generally, the individual decision to accept a job offer or stay in employment largely depends on the reservation wage. The reservation wage indicates the lowest wage a worker is willing to accept. It is determined by different factors, for example by individual preferences concerning leisure time and work, by the wage rate earned in previous jobs, by the generosity of unemployment benefits and by obligations the unemployed have to fulfill concerning job search (Christensen 2005; Prasad 2004). With regard to older workers, age specific features become important, e.g. concerning the duration of unemployment benefits, legal obligations concerning job search behavior or the availability and the level of pensions. The more demanding the legislation becomes for (older) workers or unemployed, the higher the pressure on the (older) unemployed to stay in the labor market. However, there is a problem. The reservation wage of older people is generally higher because commonly they received higher wages before becoming unemployed than younger workers. Therefore older workers do often experience wage losses when leaving unemployment (Dietz et al. 2006; Zwick 2008a, 2008b). Such high reservation wages might be barriers to enter the labor market. High reservation wages of older unemployed imply that they might not be willing to accept a job with a lower wage compared to their previous job. If workers stay reluctant to accept job offers with lower wages they run the risk of increasing barriers on the demand side because companies judge longer periods of unemployment as a signal for low productivity. As higher unemployment benefits and longer periods of benefit duration (for older workers) increase the utility of waiting for a better offer “generous” features of unemployment benefits may render labor market integration of older workers less likely. With respect to these considerations recent policy decisions do not point to the right direction. For example, the duration of UB I for older unemployed was prolonged again in 2008 from a maximum of 18 months to a maximum of 24 months. At the same time recipients of UB II aged over 58 years, who have not been offered a job covered by the social security system during the course of the last year do not count as being unemployed anymore. The latter also contradicts the steps toward more reliable unemployment statistics. A weak employability is certainly a barrier for individuals to enter the labor market. One question is how far such barriers are of specific importance with respect to the labor market participation of older workers in Germany. Barriers can exist on both sides of the market and can also involve a lack of labor market programs. As already mentioned in Sect. 2, employers may have negative perceptions about the productivity and the adaptability of older workers. The European Survey of Working Conditions indicates that in 2000 about 6 per cent of all German employees reported that they have directly experienced age discrimination or having witnessed age discrimination in their workplace during the previous 12 months. The share was slightly above the EU 15-average of 5 per cent. Unfortunately, there is no more recent information available. By contrast more recent evidence from the IAB Establishment Panel suggests that companies appreciate certain characteristics of older workers such as experience, discipline, loyalty and reliability (Bellmann et al. 2006). Nevertheless, some characteristics such as a lack of flexibility or compliance are set equal to low work performance. In addition, the IAB Establishment Panel reveals several issues that hamper the labor market participation of older workers. A considerable share of firms report—among others—that they do not recruit older workers because they did not receive applications from them (Brussig and Bellmann 2008). The surveyed firms also report a low level of measures which address older workers including firm-specific training (Bellmann et al. 2007). Empirical evidence further suggests that seniority wages may strengthen worker loyalty. However, they are likely be accompanied by lower hiring and retention of older workers (Heywood et al. 2010). Germany seems to be a case where this argument is relevant. Whereas in many countries cross-sectional data on earnings by age show for the period between 1998 and 2003 at least for men a hump-shaped profile, this was not true for Germany (OECD 2006). There, earnings obviously rise more steeply with age and show almost no tendency to decline in the older age groups. Barriers to employment exist not only on the side of employers but also on the side of the labor force. Section 3 already revealed that a low level of skills significantly reduce the probability of older workers to stay in employment. Long-term unemployment and a lack of training can even lead to a continuous depreciation of human capital. The latter argument is particularly relevant for Germany because the share of long-term unemployed is still one of the highest in the Western world and the inclusion of older workers in firm-specific training one of the lowest among OECD-countries (OECD 2006; OECD 2009). In the case of Germany older persons suffer not seldom from multiple obstacles such as the co-existence of lacking skills and health problems which do not only create difficulties to enter or stay within the labor market but also limits the capacity to generate earnings which ensure subsistence (Achatz and Trappmann 2011; Dietz et al. 2009). This leads to the question how far older workers are involved in active labor market programs. There are several policy measures to achieve a labor market integration of older workers, for example training measures, wage subsidies, in-work benefits and subsidized employment on the secondary labor market (Eichhorst 2006). In-work benefits especially concentrating on older workers (Entgeltsicherung) try to overcome this problem by achieving an early labor market integration: The Federal Employment Agency bears half of the wage differential between the last job and the newly offered job. However, the instrument is not used widely (Dietz et al. 2011). According to the firms’ demand for older workers their expected productivity is crucial. If firms expect older workers to be less productive, temporary wage subsidies like the Eingliederungszuschuss are one way to open the door for older workers (ZEW et al. 2006; Stephan 2009). It can also help to change the firms’ attitude toward older workers so it might have an additional benefit. Another possibility to increase the chances of finding a new job especially when a lack of human capital might be the problem is to engage in further training. While all these measures aim at a more or less direct labor market integration there might be good reasons to assist (older) people with poor employment perspectives by offering subsidized employment (like job creation schemes called Arbeitsbeschaffungsmaßnahmen for beneficiaries of UB I or work opportunities called Arbeitsgelegenheiten for beneficiaries of UB II). These instruments may be an option to bring unemployed people closer to the labor market and allow for at least partial labor market participation. Table 3 presents an overview of labor market policy measures and gives an impression of the participation rate of older unemployed. For example older unemployed are underrepresented in training measures. While their share of all unemployed was about 30 per cent at the end of 2010 only one out of ten persons in training measures was older than 50 years. In addition, older workers are overrepresented in wage subsidies and especially in job creation schemes. This might reflect the already mentioned problems of employability and a lack of labor demand—but it may also be an indicator for a policy concerning older unemployed persons that does not focus on labor market integration but on activities bridging the time until retirement. In-work benefits like the Entgeltsicherung aiming at narrowing the gap between wage offers and reservation wages are still of minor importance although the numbers increased during the last years. With respect to the decision to shift the retirement age to 67 years there might be good reasons for a stronger focus of active labor market policy for older workers on training measures and more direct labor market integration. Our findings show that the labor market situation of older workers has significantly improved over time. In the last decade their unemployment rates went down und employment rates tend to adjust to the situation of younger age groups. Particularly workers aged between 55 and 59 years took advantage of the improvement. Nevertheless, the employment situation of older workers in Germany is still not satisfactory. As we do not observe increasing entry rates for older people the development is due to a higher stability of existing employment relations at least partly resulting from institutional changes and due to a stronger labor market participation of women. But especially workers older than 60 years are still lagging far behind and there are severe problems remaining in bringing older unemployed back to work as the low transition rates from unemployment to unsubsidized jobs show. All in all, older workers continue to be a group with labor market problems. Thus an important question is how far the recent improvement will be sustainable in the foreseeable future and what remains to be done to support the labor market participation of older persons. What we observe is a longer lasting trend that gained momentum during the last years of strong economic growth. The economic upswing vitalized the labor market in general with spill-over effects for older workers. But it is important to understand that the situation was improving already in times of weak economic growth—so we can assume that the labor market performance is not only growth-induced. Although the impact cannot be measured precisely it seems plausible that the institutional turnaround due to pension and labor market reforms may claim a certain share of labor market success of older workers. At least they can be interpreted as a signal for all parties involved that a longer working life is urgently needed. Considering the stepwise expansion of the working life until the age of 67 and other changes that close the door for early retirement the focus is changing. For the future stronger emphasis on the issue of employability will be of greater importance. To maintain workers’ employability is a mutual interest of workers, companies and the society as a whole. First of all, the topic of employability is an issue on the firm level. Here, German companies up to now do not have achieved a strong participation of older workers in training activities (Bellmann and Leber 2008). This is important with respect to a stable employment relationship but also in case of unemployment. Without being regularly trained to deal with new technologies, a quick and sustainable labor market re-integration will become difficult. Of course securing employability is not only the duty of the employer but is also at the utmost interest of workers. Especially with respect to further training of more experienced workers a culture of further qualification would benefit both sides of the labor market. Obviously employability is a key issue for labor market policy as labor market integration requires a certain degree of employability. The primary focus of active labor market policy lies on a fast integration in unsubsidized jobs. This can be seen as the silver bullet for unemployed persons with a high degree of employability—no matter how old they are. With respect to older unemployed there are opportunities to further improve the prospects. On the one hand, the unemployed can even show more flexibility and readiness to accept job offers at hand in an earlier stage of unemployment in order to avoid long-term unemployment. On the other hand, firms may not discriminate against older applicants but should be willing to give them a try and benefit from their capabilities. If the labor market integration is not easy to reach it may be necessary to stabilize or increase employability by training measures—again having in mind an unsubsidized job. Also temporary wage subsidies may be a way to build a bridge to a new job. Wage subsidies aim at enhancing employability and thus productivity on the job, so the wage subsidy will not be needed anymore after a certain period of time. Finally, subsidized work on the secondary labor market is only needed in order to concentrate on workers with multiple obstacles to find a job. With respect to all measures of active labor market policy it is important to state that age itself is not an obstacle on the labor market that should trigger the application of labor market policies. Rather active labor market policies should try to find solutions to individual problems of which age is not a relevant category. In a broader perspective on the challenges ahead it is obvious to link labor market policy to other policy fields, applying a stronger focus on a life course perspective. A preventive approach regarding life-long learning and life-long health protection is probably the most favorable policy for individuals aiming at a long working life and a secure retirement income. For example, workers in physically or mentally stressing occupations can be offered opportunities to change to different tasks early enough. A shrinking labor force and the threat of skill bottlenecks in the near future will increase the pressure to deal with the consequences of an aging society, an aging work force and last but not least an aging staff. In the future there are not only fewer young people entering the labor market, but their skill composition does not always have the necessary quality to match the firms’ needs. Although some companies may have realized yet that older workers are a precious resource a sustainable labor market participation of older workers remains an important issue. If older workers really leave their status as a problematic group on the labor market there will be good chances to extrapolate the positive employment trend into the future. In this case Germany will—at least in the long run—have the potential to really become a country for old workers. As in many other industrialized countries the German labor force is shrinking and growing older. Therefore the labor market situation of workers aged 50 years and older is of particular importance. However, the employment situation of older workers used to be poor in Germany compared to younger workers as well as compared to older workers in other countries. We analyze the labor market situation of workers within different age groups for the period between 1998 to 2010. As there are several channels to reduce employment of older age groups without increasing unemployment (e.g. by transferring them to other social security systems through (early) retirement schemes or rules according to disability) we are concentrating on employment figures. The relative growth of employment covered by the social security system for people over 50 has been superior to the development for people aged below 50 years. With respect to subgroups of older workers (50–54, 55–59 and 60–64) we observe some variations. Although the number of workers aged 60–64 was increasing over time, too, it is still on a very low level. The overall positive picture has also to be modified with respect to the broad use of partial retirement which is not considered appropriately in the German employment statistics. To adjust absolute numbers according to demographic effects we calculate employment ratios. Again, the positive trend remains visible. Like in many other countries the labor force participation of older workers is pushed by an increasing labor market affinity of women. The lion’s share of the positive development can be attributed to the increasing labor market participation of women. But despite the positive overall picture the employment ratios of older people are still lying below the figures of younger age groups. The older the workers are, the more difficulties they face on the labor market. This becomes obvious for the group aged between 60 and 64. Even though we observe some positive trends for this subgroup, too, their labor market participation of around 24 per cent is still far away from the ratios of other subgroups. In addition the skill level has to be taken into account. While the employment rate of workers between 50 and 59 years having an university degree is not differing much from younger age groups, the combination of higher age and low skills deteriorates the chance of being employed markedly. For a broader perspective of the employment situation of older workers labor market flows are taken into account. The labor market for older workers shows less turnover than for other age groups. Looking at relative entry and exit rates to and from employment reveals that the improving employment situation of older workers is not associated with higher entries but with a higher stability of existing employment relationships. Once becoming unemployed, starting a new job is seldom for older workers. The difficulties of bringing older unemployed back to work result in higher long-term unemployment. Employment barriers exist on both sides of the market. While firms may be reluctant to hire older workers, seniority wages may be one obstacle for taking up a new job where wage deductions become necessary. Finally there may be skill mismatch because of long-term unemployment or a lack of training during the last job. There are several labor market programs in order to overcome these barriers. Looking at the participation of older workers in these programs reveals that the focus is more on wage subsidies and subsidized employment and less on training measures. Searching for possible reasons for the development at hand we identify a positive overall economic situation during the years before and after the economic crisis which vitalized the labor market in general with spill-over effects for older workers. But as the situation for older workers was improving already in times of weak economic growth the labor market performance is not only growth-induced. The employment situation of older workers may also be influenced by the design of labor market institutions and the pension system. We describe recent policy shifts to strengthen the labor market performance of older workers, e.g. reforms of the public pension schemes and unemployment benefit systems increasing work incentives and sending out signals that a longer working life is needed. In the next decades the issue of employability is a mutual interest but also a mutual obligation of workers, companies, the state, and the society as a whole. This is particularly true with respect to the decision to shift the retirement age to 67 years until the year 2030. There are still some duties to be fulfilled in order to make Germany a country for old workers in the future. The potential labor force consists of the employed, the unemployed and the hidden labor force. Even if we assume an increasing labor force participation and a net migration of 100 thousands a year the potential labor force still decreases by 8 percent until 2025 (Fuchs and Zika 2010). In this context it needs to be mentioned that Germany experienced some major changes in counting older unemployed in its national statistics. We will come back to that issue in Sect. 4. For the development of unemployment ratios for different age groups over time see also Arlt et al. (2009). Marginal part-time work (“Mini-Jobs”) not fully covered by the social security system have been excluded from our analysis. The latest available data according to the Statistics of the Federal Employment Agency show that the numbers rose up to about 680,000 in December 2009. The calculation is based on the assumption that the figures for self-employment and partial-retirement remained almost the same in 2010. The “lower boundary” with respect to partial retirement would lie around 60 per cent. The “employment rates” in Table 1 cover all gainfully employed persons (dependent employed, marginal workers and self-employment) as part of the corresponding population. Data concerning entries and exits are not available for 2010 yet. The authors thank Johann Fuchs, Markus Hummel and Thomas Rothe (all Institute for Employment Research—IAB) and the statistical department of the Federal Employment Agency for providing data as well as Laura Dittrich and Carina Himsel (both IAB) for technical assistance.